12 August, the ‘Glorious Twelfth’, when Victorian high society would leave London for moors, marshes and hills and the grouse-shooting season. It was the Game Act of 1831 that had introduced closed seasons, defined periods when the shooting of certain wildfowl species was strictly prohibited. The popularity of game within Georgian households had threatened the survival of many wild bird species in the British Isles, and government legislation was considered essential to protect economic interests in game bird populations. The common snipe was not included in the 1831 Game Act. Perhaps their effective camouflage and erratic flight patterns helped to keep snipe populations buoyant for much longer than those of grouse, pheasants and partridges. 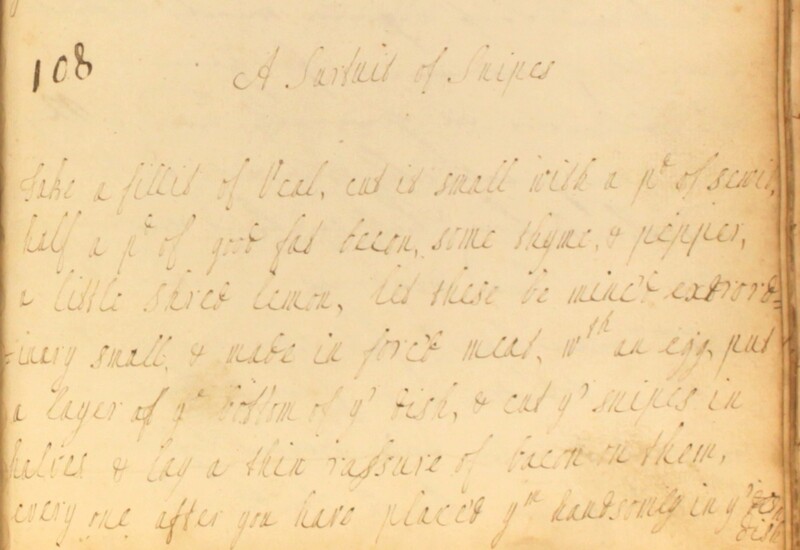 Despite snipe being notoriously difficult to catch, our 18th century cookbook compilers clearly knew someone skilled in hunting these elusive animals, for here is a recipe for a ‘surfeit’ of them. It’s a rich, meaty dish, perfectly suited for the onset of chilly autumnal evenings. So while the summer is still with us, maybe just make a mental note of it for a later month, when you have an appetite for something hearty and comforting. Indeed, snipes are considered at their best between December and January. Take a fillit of veal. Cut it small with a pd of sewit, half a pd of good fat bacon, some thyme & pepper, a little shred lemon. Let these be minc’d extraordinary small, & made in forc’d meat wth an egg. Put a layer at ye bottom of yr dish & cut yr snipes in halves & lay a thin rashure of bacon on them, every one. After you have place’d ym handsomly in yr dish, strow a good deal of crumbs of bread & shred parsley & a very little pepper over all. 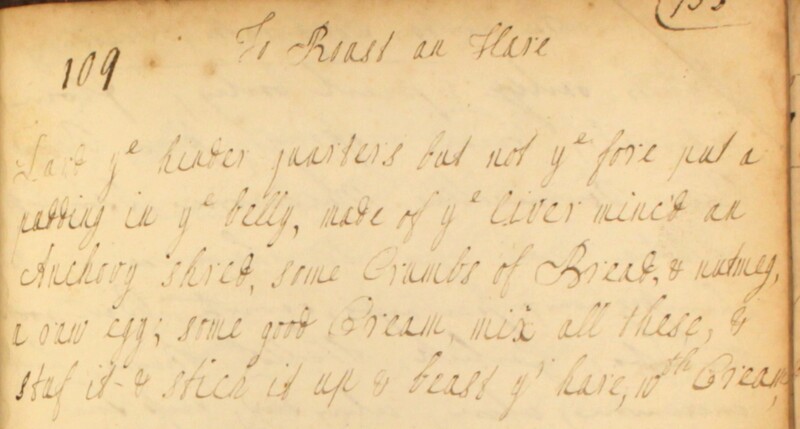 Put some forc’d meat on ye edge of yr dish, & yr forc’d meat yt is left put as a lid over ym. Bake it an hour at least. When it coms out, cut a whole in ye top & pour in some very good greavy. So serve it up for first course. The Georgians delighted in gastronomic dishes, but they were also talented in consuming food efficiently, with very little waste. Our Cookbook of Unknown Ladies contains many good examples of the Georgians’ “waste not want not” ethic in the kitchen. Here, a recipe for roast hare is paired with another for preparing the pelt. Lard ye hinder quarters but not ye fore. 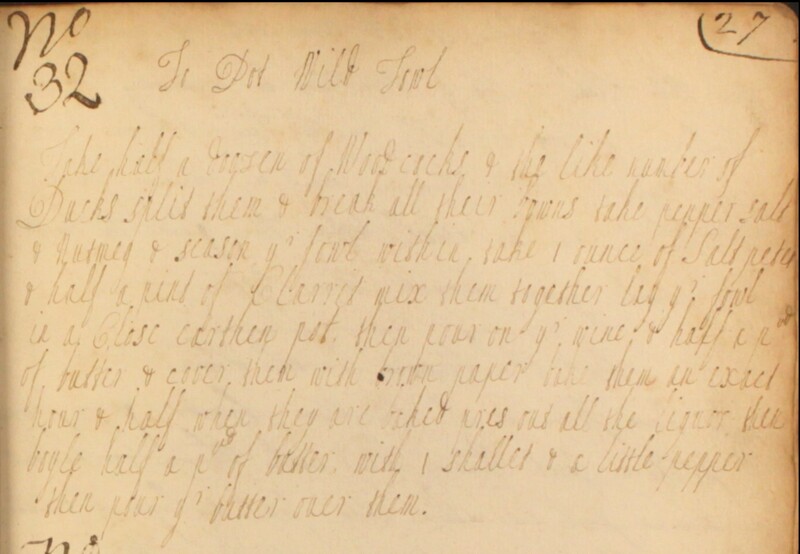 Put a pudding in ye belly made of ye liver minc’d, an anchovy shred, some crumbs of bread, & nutmeg, a raw egg, some good cream. Mix all these & stuf it & stick it up, & beast yr hare wth cream. Take a fresh skin & boyle bran & water & wash ye skin in it. When it is milk warm, let it lye therein 4 or 5 hours. Yn wash ye bran of it & make a strong pickle of salt, allom, & water. Boyle ye pickle & when milk warm, wash ye skin well in it. 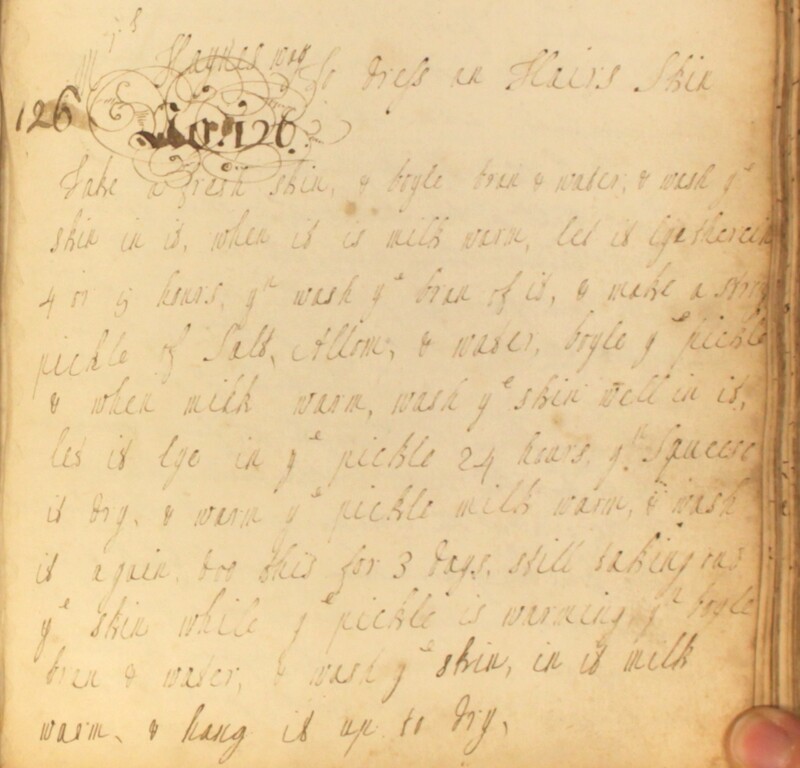 Let it lye in ye pickle 24 hours, yn squeese it dry & warm ye pickle milk warm & wash it again. Doo this for 3 days, still taking out ye skin while ye pickle is warming, yn boyle bran & water & wash ye skin in it milk warm & hang it up to dry.